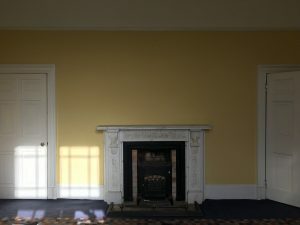 I’m not sure if it is every interior designer’s dream to work on a beautiful period property at least once in their career, but it has definitely been one of mine. 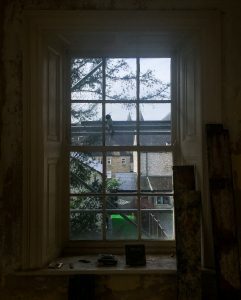 I know they tend to be problematic and there are many regulations and rules you have to follow and be mindful of, but still…give me sash windows, high ceilings and ornate covings and all my senses go out the window! Lancashire (and the North West in general) is full of gorgeous period properties so I’m really lucky to live and work where I do. This project (I will call it The Georgian – fancy, eh?) is very close to my heart and I feel incredibly lucky to be involved in its renovation (as I am with every other project, of course). It is also the most current and largest project I am working on at the moment and it’s my biggest source of inspiration and learning. It would be rude of me not to share my observations with you! 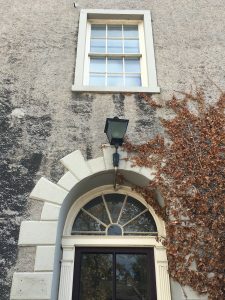 I remember parking up at the house for the first time, waiting for the clients to arrive, and thinking that this beautiful Georgian house is just a little bit unloved but oh-so beautiful. I loved the way it stood so tall and proud near a town centre, cleverly hiding behind tall trees on a little side road. Unless you are a well-seasoned designer completely in touch with your confidence, chances are that you too find consultations somewhat daunting and scary. It’s a little bit like going on a first date – only after the initial shock of the ‘will they like me; will they want me’ dating game things settle down and you start concentrating on the actual job on hand. A clever lady once told me that you (whether you are the client or the designer) need to look at an initial consultation as a chemistry meeting. More than anything, you are there to figure out whether you are right for each other; you will spend so much time together, making decisions together, being on the phone or writing emails that it is absolutely crucial to establish right from the first meeting if you have chemistry. For me, the first consultation at The Georgian just felt right. I felt free to express my opinions, offer advice and to just be me, and I came away thinking that the house and its brand-new owners were a match made in heaven. 7 months later we are plastering walls and choosing external paint colours. There is still a lot to do but in a few short months, I will no longer be needed (sigh). 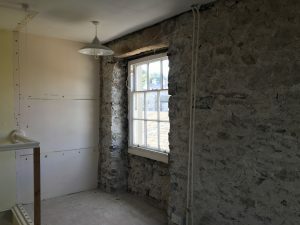 So, what have we learnt during these past 7 months about renovating a period property? Old houses are a little bit like wine. If cared for, they get better with age. If not…well, they get grumpy and they like to show it. 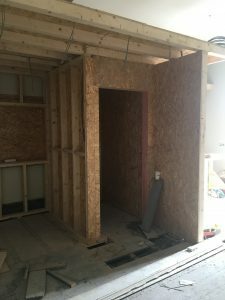 If you have OCD and you like to follow a strict schedule of works you might find the process of renovating an old house difficult, because you never know what’s IN there. 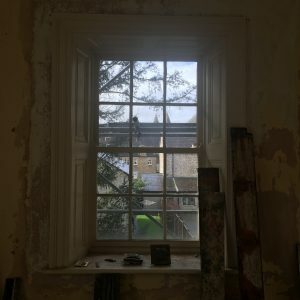 You will only start learning more about the state of the building and finalising your to-do list once you start peeling back the outer layers and you look at the bones of the building. 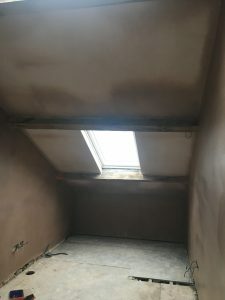 You might be pleasantly surprised, but you also might find issues – for example with things like damp course, insulation or rotten floor boards – that will add an additional amount to your already growing final bill. Again, this building is OLD. It has gone through a lot more than you have and you need to give it time to adjust to your needs. Rather than rushing the building work and make costly mistakes, take your time and get to know the house before you make any major decisions. You’ll thank yourself for it. I’m stating the obvious over here, but period properties are very different from new builds. Since you own one, I will assume that you fell in love with the house as well as its history and heritage. No matter what your style is, try to respect your new home by keeping the bits that make it special. Balance is the power word here, and I can never stress the importance of finding it often enough (trust me, I probably say the sentence ‘It’s all about finding the balance’ around 5 times a day). With a little bit of consideration and thought, period features can be beautifully built into the mental image of your ‘dream home’, whatever the style. Let’s start with the biggest one: space layout. Getting this right is absolutely crucial because this will pretty much dictate the way you live in the house. What is the point in having that really expensive log burner if you will have to walk across the entire room from your sofa just to feel the warmth of it? Other things like where you place your internal doors, which way your bed will face, the type of lighting you need in your bathroom (all relatively straightforward but often missed) are also things that can make or break a design scheme. This is nobody’s fault and if I’m honest, I have never seen a renovation where this isn’t the case. The larger your project the more room there is for mistakes to be made. This is completely normal and absolutely fine – the trick is to find a way to work around it and solve the issue instead of falling into pieces and loosening your grip over the rest of the project. There is no issue that can’t be solved so taking a step back and looking at the bigger picture is often necessary. When you have 15 different trades working on your home, you have a full-time job, kids to raise etc. communication becomes very important and even with the most experienced professionals on board, things just happen. Embrace them, discuss them as soon as possible, and work together to fix them. This is important, and not just because I am one. You are spending you hard earnt pennies on a professional to HELP you with your project. There is a reason why you chose to work with that particular person so hang onto that and remind yourself of it if ever in doubt. These people are there to help you, to use their experience in a way that benefits you – to put it simply, they want to make YOU happy. You might not always agree with them and often you will have an entirely different vision or opinion to theirs but the best possible thing you can do for yourself is to work with them, not against them. It can be really hard to pass control onto someone you don’t know all that well (especially when it comes to your own home with all it’s emotional attachment baggage) but there is a reason you’ve hired these people. 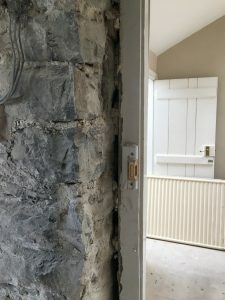 There you have it folks, the 6 main things I have learnt about working on a period property! If you would like to see more of this project, head over to @our.georgian.house on Instagram!